We seem to have settled into a bit of a camping rhythm. We’ve been doing more freedom camping (essentially pulling off somewhere beautiful and staying the night) or stopping in Department of Conservation campsites (designated sites within national park areas with minimal nightly fees). 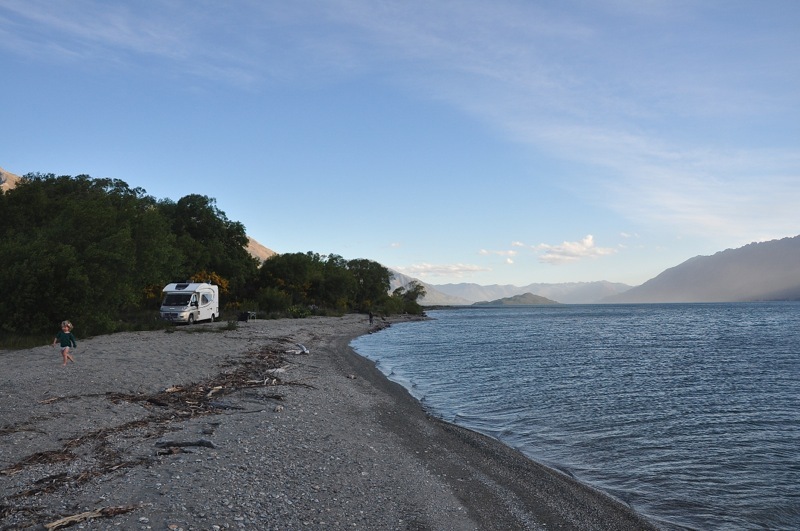 After a couple of days of this more off-the-grid style, we pull into a commercial campsite (often a Top 10 brand since they have playgrounds and consistently clean bathroom, kitchen, and laundry facilities). We dump our water and waste, fill up with clean water, plug the van in for the night, take (longish) warm showers, and do laundry. These sites are more expensive (averaging at least $50/night) and less picturesque, so we’ve been trying to cut back on them for both budget and aesthetic reasons. We also had a bit of a fender bender in one of them the other day, as they’re often quite crowded (thankfully no one was hurt, but the van will need a little cosmetic patching up when we get to Christchurch – I’m now quite happy we opted for full coverage insurance). Meals have also taken on a certain rhythm. Perhaps once a week we indulge in a restaurant dinner, usually when we’re passing through a larger town. Even being used to NYC prices, I think restaurants and groceries are quite expensive here, so we try to keep eating out to a minimum and focus our funds on van provisions. For breakfast we have bran cereal or bread (toast if we’re plugged into power) with marmite or peanut butter, bananas, and apples. About once a week, we have a more leisurely pancake and bacon breakfast; we even managed to find some (very expensive and very delicious) organic Canadian maple syrup! Lunch is usually sandwiches, raw vegetables, and fruit, often in picnic form during a hike. When we’re in the van, we also usually heat up some soup. We seem to rotate through several dinner options – pasta, daal and rice, vegetable and tofu sitrfry, an egg-based dish, and chicken fajitas (the family favorite). Snacks feature carrots, apples, rice cakes, and cheese and crackers. We’ve also taken to buying biscuits (to have with tea and as midnight snacks) and Carl is slowly becoming addicted to his “driving candies.” And, of course, endless bottles of fizzy water – I miss our Soda Stream! Oh, and quite a bit of red wine. Carl is the driver-in-chief and I’m the itinerary/route-planner-in-chief and a second pair of eyes on the road. It’s been really nice to take each day as it comes. I usually try to have a general sense of locations for the upcoming three days, and then finalize the exact destinations and overnight stopping points in the morning right after breakfast. Thus far, we’ve been able to drive up to all campsites except one without a reservation; this may change the closer we get to Christmas holidays. We’ve now been on the road in New Zealand for 47 nights and we have 21 to go before we head to Australia. We’ve driven a little over 5000km (3100 miles). And we like camper vanning! 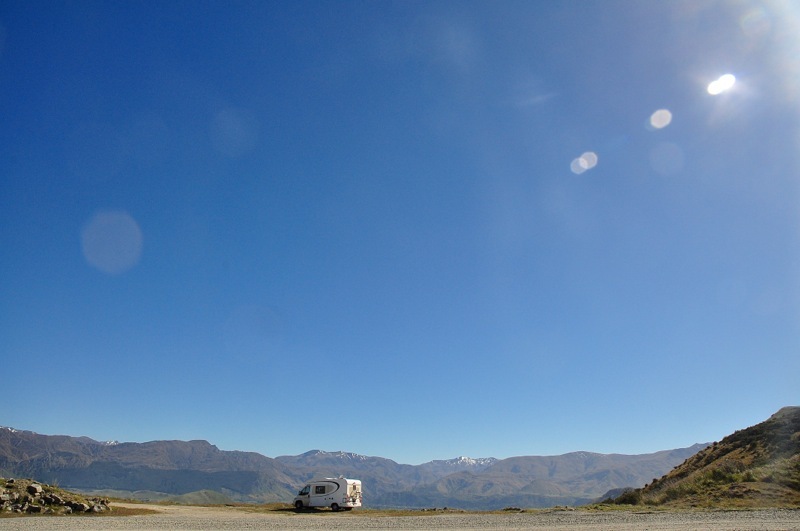 We’re already discussing future vanning options – Iceland, northwest and southwest United States, South America! But for now, we’re focusing on the next three weeks here in this absolutely stunning country. Leah Kalm-Freeman is a photographer, explorer, and the creator and blogger of Adventure Mondays. She and her family are spending a year traveling together with a spirit of adventure in their hearts.